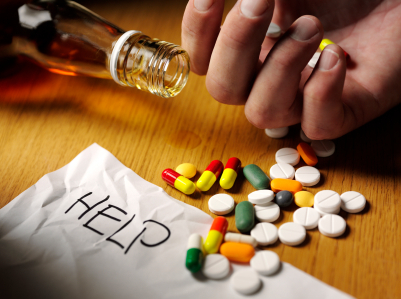 Earlier this week, I wrote the post, “Depression, alcoholism and drug addiction…Saving lives is the Answer”. Completely by coincidence, on Wednesday, July 21, we learned that the Tredyffrin Township police had arrested Lynne Twaddle, age 61 of Pugh Road on suspicion of dealing heroin from her Wayne home. Twaddle was charged with possession of a controlled substance with intent to deliver, criminal conspiracy, possession of drug paraphernalia and criminal use of a communication facility (phone). Beyond scary is the fact that Twaddle’s house is located 150 ft. from the entrance drive to New Eagle Elementary School. As a follow-up to the post on Community Matters, I received an email from Tredyffrin Township Police Superintendent Anthony Giaimo and was given permission to share it. 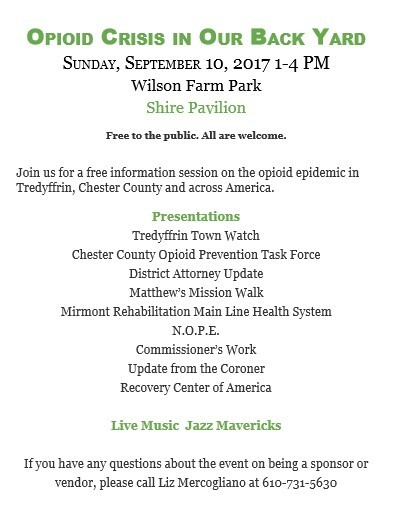 Valuable information, the public needs to know that the Tredyffrin Police are actively involved and continuously seeking ways to combat the growing local drug abuse problems. Thank you for your recent post regarding substance issues within our community (and beyond). We need to spread the word! We have seen drug related tragedies among our young residents year after year. We have taken a number of progressive steps, which have gained the attention of Commonwealth officials. We were the first in the Commonwealth of PA (with ARCH) to acquire and maintain a drug “turn in” box. Additionally we have hosted town hall meetings (Kacie’s Cause) and are continuous attendees and participants at ARCH meetings. We are presently formulating new educational programs through our Community Policing Unit. One resource that has received excellent feedback is our new Crime Watch program. On this site, I posted a Parent’s Tool kit, suicide prevention and drug / substance abuse resources as well as other resources posted by our Community Policing Director Rhonda Carroll. Our site can be found through the township website or at www.tredyffrinpd.org (There is also a mobile app). 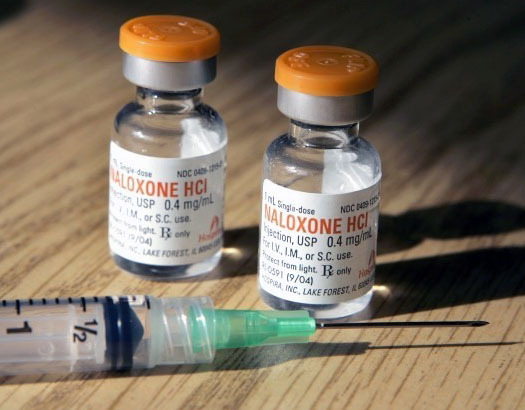 A number of people have asked if the police department uses NARCAN, an opiate antagonist, to combat the potential loss of life from a heroin over dose. I can say that we not only have this drug in all of the police cars but were on the leading edge of this program. To date we already saved a life with the use of NARCAN. Rest assured we (I) will keep up the pace to keep our community safe from this deadly drug influence. As we learned from Supt. Giaimo, the Tredyffrin police have already saved one life with the use of NARCAN. If residents have concerns and/or questions regarding substance abuse, you are asked to contact Tredyffrin Township Police Officer Rhonda Carroll, Director of Community Policing, Tel. 610.644.3221. As you may have read in the news, on July 21 the Tredyffrin Township Police arrested a District resident for alleged sale of heroin. We congratulate the police on their continued efforts to combat the distribution of illegal drugs, and we cooperate as needed. The alleged perpetrator lives in close proximity to New Eagle Elementary School, but I have been assured by Superintendent of Police Anthony Giaimo that although the investigation is ongoing, there is no connection between this arrest and any T/E students at this time. The District will continue to implement and extend safety measures to promote greater security in our schools. Such measures include but are not limited to buzz-in systems at school entrances with video capabilities, external fencing, improved locks on classroom doors, external window signage, and updated emergency preparedness procedures. Additionally, we continue to provide age-appropriate educational opportunities and support programs across the curriculum for students to learn about the negative consequences associated with illegal and prescription drug use and abuse. I thank the community for its continued support of these District efforts. I n June, I learned that a local 20-something year old CHS graduate had committed suicide. Although I did not know the young man personally, I was told that he suffered from depression, drug addiction and was on probation through the courts. Having attended the funeral of his friend, another young man, himself a Conestoga graduate, sent me an email. I’ve been struggling with addiction for 5 years now. I know that people need to get it on their own, but I mean trying to educate them before this happens. If I saw a fellow peer talk about how he/she just started out experimenting with drugs and eventually led to what it led to for me who knows what I would have done differently. The problem is hard drugs have been normalized in the high school and almost glorified because they don’t see what happens when they are a little older and all of their friends are dying. We have 15-year-old girls in Conestoga that are shooting heroin! It’s absolute insanity. Something needs to be done; we just lost ANOTHER graduate, one of my best friends, 3 days ago to this stuff. The young man who sent me this email told me that had sent an email to the T/E School Board asking for their help with the drug problem in the schools. Last year, Chester County officials released the statistics report on fatal heroin overdoses in the county. Since 1999, the overdose death rate in Chester County has doubled with 24 overdose deaths in 2013, with victims ranging from 21 to 79 years old. Fourteen were men and 10 were women. The report indicated that 18 of the fatal overdoses or approximately seventy-five percent, both heroin and prescription drugs were involved. In 2014, we learned of the arrest of 11 people involved in the ‘Main Line Take Over Project’, a drug trafficking ring. Two Haverford School graduates were the drug operation kingpins and hired students at main line high schools, including Conestoga, Radnor and Lower Merion as their drug peddlers. Every child is at risk. According to experts, those with risk factors, such as a family history of mental illness or addiction, have a greater chance of becoming addicted. Alcoholism and drug addiction is a disease. People are suffering from this disease and dying from this disease every day. We really can’t do anything as a society to help those people until we start talking about it. My name is Liz Mercogliano. I serve as a current T/E school board director. I also have practiced psychiatric nursing since 1984. I am a practicing Realtor and lawyer. I wanted to share the facts on overdose and/or harm to self or suicide. At T/E, I support giving our students mental and emotional support. Every year we lose a child to suicide or overdose. Overdose can happen in a second with prescription, legal and illegal drugs. Many students and families are not familiar with the signs and symptoms of psychiatric disease or the fact that everyone has different levels of depressions throughout their lives. As a result, there are accidental overdoses as well as serious unidentified clinical depressions that may lead to suicide. Please realize depression is treatable and many overdose accidents result in life changing events for the individual. The right thing to do is to help those who need our help. This help includes identifying persons at risk and offering professional help. This is not a small matter in our community. When it happens to you or a loved one, find help. In my mind, EMTs and the ability to reverse the overdose will make our community a better place. Saving lives is the answer. Provide mental and emotional support all the sick whether it is a traditional medical disease or drug or alcohol disease. After researching the issue and speaking with experts, a nonpartisan group of six residents (Ray Clarke, Neal Colligan, Jerry Henige, Barb Jackson, Peggy Layden and myself) believed the School Board deliberations at the TESD February 3, 2015 board meeting violated the Pennsylvania Sunshine Act. On February 13, 2105 via Certified Mail, a thoughtfully written letter was sent to the School Board members (President Kris Graham, VP Doug Carlson, Virginia Lastner, Scott Dorsey, Karen Cruickshank, Kevin Buraks, Liz Mercogliano, Jim Bruce and Pete Motel) stating our specific concerns regarding their process. (Click here to read February 13 letter to School Board). As residents, we believed that with quick action at the next TE School Board meeting on February 23, the Board could remedy the process and maintain the trust of the community in the integrity of the District’s governance. As District Solicitor, I respond on behalf of the School Board to the allegations of non-compliance with the Sunshine Act by the School Board contained in the letter you forwarded below. Please forward this response to the other signers of the letter. At all times, the Board carefully considered its obligations under the Sunshine Act prior to each executive session and Board information meeting conducted with respect to the issue of benefits for District employees in light of the Affordable Care Act (ACA). At no time was the Sunshine Act violated. Moreover, the February 3, 2015 Board vote on this fully disclosed agenda item occurred after a lengthy public presentation, public Board discussion and public comment in full compliance with the Sunshine Act. Although the reply is not surprising, I disagree and find it inadequate and dismissive as a response to the well-researched points that were raised in our letter of February 13 to members of the TE School Board. It’s unfortunate that these five separate Affordable Care Act discussions were held in private, out of the light of the public eye and the benefit of public deliberation. It’s unfortunate that deliberation regarding an employment policy change for 73 full-time District employees occurred in private and that a resolution simply appeared at the end of the meeting with no advertisement or notification. It’s unfortunate that the misleading ‘ACA Update’ listing on the meeting agenda is referenced [in the above response] as a “fully disclosed agenda item”. It’s unfortunate that 73 dedicated full-time District employees are notified of the School Board’s policy change and outsource decision via a 10:30 PM email following the meeting. It’s unfortunate that the public’s participation is not valued in important policy decisions. There is no doubt that members of the school board have received many emails and phone calls from residents since the February 3 School Board meeting and my guess is that virtually none of these contacts was in support of their actions. I cannot imagine that the actions of the TE School Board were not a violation of the Sunshine Law, but I can guarantee that it is a violation of the public trust. I am disappointed to receive this denial of a crystal-clear case of a Sunshine Law violation by the individuals on the School Board. However, I suppose it would be a rare lawyer that would advise acknowledging guilt before the proceedings have begun. I am more disappointed that there is no sign that the Board plans to do the right thing and address the community’s widespread concern, in Monday’s meeting or at any other time. Residents have been deliberately shut out of a matter of widespread concern and need to make their feelings clear to the Board. Ken Roos is the solicitor in the Lower Merion School District as well as the TE School District. I understand that the Radnor School District has recently hired him. It is well documented that Lower Merion residents are frustrated and angry about transparency issues in their district. I am disappointed that when confronted with legitimate questions about transparency and open communication from community members, the board turns to the solicitor Ken Roos to write this letter, instead of making every attempt possible to be open and transparent and invite community participation and input. Really surprised they sent such a short and dismissing response. Our challenge to the Sunshine Act centers on the 5 Exec Meetings concerning this topic…not covered by the list of items allowed in Exec Session. This response does not defend the reason for these meetings only that “the Board considered … at no time did they violate…”. Our challenge to the process in deciding this issue was well thought-out, supported by experts we consulted and well written. The response was a simple quickly written e-mail. The two communications say volumes in their structure. This is a legal response saying the Board met the minimum technical standards of the Act. Until proven otherwise, it’s a plausible defense. That said, it’s hard for me to think that all members of this elected body agree with the handling of this issue. I’m hopeful at least one member objects to the process in light of the public challenge … whether it can be proved right or wrong. I’m surprised but not shocked … possibly someone elected to represent the community will address the process employed here by stepping out from behind the Solicitor. We’ll see. I’ve made an Open Records Request asking for the details of these Exec. Sessions not previously disclosed in public communications. We’ll see what that brings. Maybe the process was a full vetting of all alternatives in a thoughtful and complete presentation over several meetings … maybe not. Maybe the decision had been made a long time ago regarding these employees and the ACA and the Exec. Sessions were based on creating a tightly scripted response and explanation to be given at the end of a long public meeting with questionable (although technically compliant) notice to the community. Likely, we may never know … I’ll share what I receive when/if I get a response to my request. IMPORTANT: The next School Board Meeting is this Monday, February 23 at 7:30 PM, Conestoga High Schools. This is an important issue — please plan to attend the meeting and have your voice heard. Your Voices Matter … They Saved the Tennis Courts! At today’s Facilities Committee meeting, chair Pete Motel and the other 3 School Board committee members, Jim Bruce, Betsy Fadem and Liz Mercogliano made a 180 degree turn from their former position of demolishing the tennis courts at Valley Forge Elementary School. With a unanimous vote from the Facilities Committee, they will send their recommendation to preserve to the tennis courts to the School Board. Motel explained that their recommendation will include the caveat of a new signed agreement between the District and Tredyffrin Township. The new agreement will be an update to the original 1974 agreement. Attending the Facilities Committee meeting, Tredyffrin Township supervisor Phil Donahue spoke of support for the District’s decision to save the tennis courts. He suggested a willingness on the part of the township, to work together with the District for a new agreement and that if it was ready by Monday, it would be presented at the Board of Supervisors meeting. Although Motel mentioned there were “sticky wickets” yet to be worked out re an agreement, I think most of us in the audience were satisfied that the tennis courts will be preserved. The padlocks have been removed and the tennis courts are again available for use. The parking lot expansion plan to add 24 parking spaces will continue this summer (without the demolition of the tennis courts). Saving the tennis courts from demolition just goes to show what can happen when a few determined people come together for a common cause. Voices do matter … and in this case, it saved the tennis courts. The T/E School Board meeting on Thursday night was rather anticlimactic. Most of us who have been following the budget process were not surprised by the 3.3% tax increase (1.7% Act 1 Index, 1.6% referendum exceptions) for the 2012-13 school year. Based on the District’s average residential assessment of $252,601, this translates to an average increase of $155 per homeowner in their tax bill. The Act 1 Index increase will produce projected revenue of $1.5 million and the exceptions increase projected revenue of $1,498,916. The total revenue produced by the 3.3% tax increase is $2,998,916. The 2012-13 tax will be levied at the rate of 19.2628 mills, on the assessed valuation at a rate of $19.2628 per $1,000 assessment; an increase of .6154 mills from the 2011-12 tax rate. Unionville-Chadds Ford School District: proposed 2.65% tax increase in Chester County and a 1.74% decrease in Delaware County (the difference comes changes in the gross property valuation of the two counties) to be approved at UCFSD meeting on Monday, June 18. Following the final budget summary, discussion and resident commentary, the school board members were presented the opportunity to weigh-in on why they were voted for or against the 2012-13 budget. The 2012-13 budget passed 7-2 with school board members Liz Mercogliano and Rich Brake providing the dissenting votes. Brake provided a lengthy 30-minute oration, which offered historical details of what brings the District to this point and his reasoning for voting against the 2012-13 budget. Ray Clarke also attended the school board meeting and offers his thoughts on last night’s School Board meeting. Thanks Ray! 1. Karen Cruickshank reported that the tone in the TEEA negotiations is “increasingly positive”. One small signal of this is the memorandum of understanding that removes the requirement for the district to pay for “advanced studies assistance”, in return for dropping the demotion idea for 2012/13. Amazingly, this saves $360,000 – and it’s not even all the tuition that is paid! (Payments are continuing for those on the lowest Bachelors steps). 2. The General Fund Balance debacle continues. At its root is the fact that the Board treats this as a completely discretionary slush fund, with absolutely no rules about how it is to be used. I believe that it is completely unacceptable for $30 million of taxpayer money be be treated so cavalierly. Just one example: last year the “commitment” for PSERS “stabilization” was $15.4 million, this year it’s $3.6 million. It’s not that the difference has been used to stabilize PSERS, it’s just that the number is a plug for when other things have been accounted for. Ridiculous. Why even have that item in the first place – we plan to raise taxes for it anyway. Having said that, the changes in this year’s commitments do move us in the right direction. $10.4 million will be moved into the Capital Fund, where it will be used for the one time expenses that we’ve discussed here are the appropriate uses for the Fund Balance. Also worthy of mention is the commitment for the liability for vested employee services. This went up by $0.8 million. The actual payment was $0.3 million; It’s interesting that the actual employment expense was therefore $0.5 million higher than was recognized in the operating statement, another problem deferred for future taxpayers. – The drop in revenues from assessment appeals offsets the increase from increasing the tax rate for the exceptions. He used this to suggest we have reached taxing capacity. – Special education is a “ticking time bomb” and the increased costs of autism “threaten public education”. Relatedly, we heard in the Policy Committee how parents of non-residents, shopping for schools, want the right to come into classrooms to observe TE”s special education programs. – All entities (governments/households, US/Europe, etc) have a “pathological addiction to spending beyond our means”. [An OT comment: In a long run he’s right that this is unsustainable, but in the short run, national governments able to determine monetary policy can have a stabilizing role when consumers all of a sudden come to that unsustainable realization. The problem in the US is that the political actors cannot agree on the long run plan to get the house in order, and in Europe, they have a completely crazy monetary union without a fiscal union]. – For TE routinely taxing to the max is unsustainable and not the solution. I note that the agreed 3.3% tax increase this year, and the subsequent annual 3% increases in the 4 year projection model accumulate to an increased tax bill of $600 per year for the average residential assessment. And there’s still a $4 million deficit in 2016/16. – He is now going to pay more attention to the Fund Balance. Good!